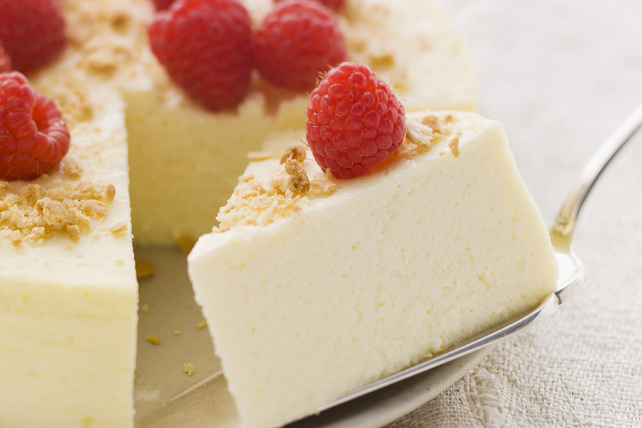 Who knew you could cook a cheesecake in the slow cooker? This oh-so-simple slow-cooked cheesecake has a silky smooth texture and lots of flavour. Combine graham crumbs and butter; press onto bottom of parchment-lined 6-inch springform pan. Beat cream cheese, sugar and flour in large bowl with mixer until blended. Add sour cream; mix well. Add eggs 1 at a time, mixing on low speed after each just until blended; pour over crust. Add enough water to 5-L round or oval slow cooker to fill to 1/2-inch depth. Place rack on bottom of slow cooker; top with filled springform pan. Cover with lid. Cook on HIGH 2 hours. Turn off heat. Let cheesecake stand in (covered) slow cooker 1 hour. Transfer cheesecake to separate wire cooling rack. Run knife around rim of pan to loosen cake; cool completely before removing rim. Refrigerate cheesecake 4 hours. Top with raspberries just before serving. Substitute halved or sliced strawberries for the raspberries. Garnish with fresh mint leaves before serving. If you don't have a rack that will fit in your slow cooker, you can instead use 4 metal jar lids placed on the bottom of the slow cooker to raise the springform pan off the bottom of the slow cooker. For best results, do not cook this cheesecake on LOW, but on HIGH heat as directed in recipe.